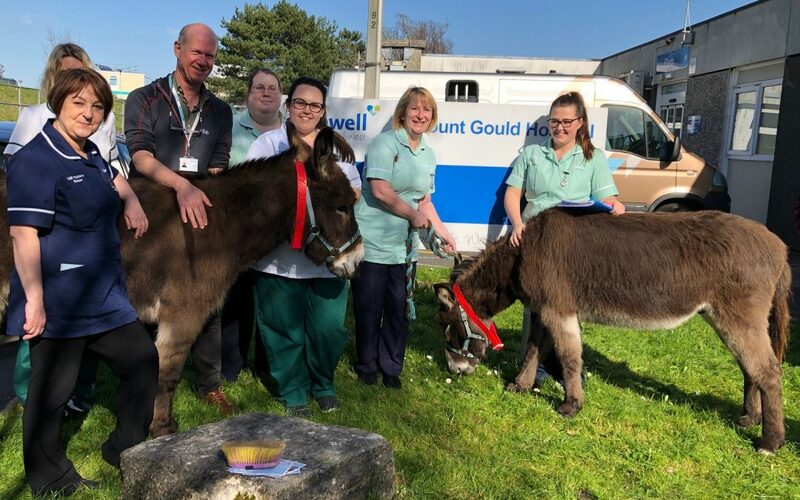 Patients at Livewell Southwest’s Mount Gould Hospital are benefiting from the therapeutic presence of donkeys on the ward. Plym unit is a specialist rehabilitation service for people aged 16 and over who have suffered brain or spinal cord injuries or other neurological conditions. And once a month the dedicated team of consultant, specialty doctor, nurses, physiotherapists, occupational therapists, speech and language therapists, neuropsychologists and social workers is joined by donkeys from the Donkey Sanctuary at Ivybridge, who perform their own special therapy. Katie Stokes, occupational therapy trainee, invited the sanctuary team after hearing about the therapy donkeys’ work and discussing it with colleagues on the unit. Staff say patients with very limited arm movement are stimulated to reach out to touch the donkeys, and the visits inspire others who struggle with communication to engage. The donkeys go onto the ward in cold or wet weather, but this week patients and donkeys enjoyed the sunshine – and grass – outside the unit. A more mobile patient was happily chatting to the sanctuary team while brushing Paddy, remembering the donkeys who live near his home. “It’s wonderful,” he said. Find out more about Plym Neurological Rehabilitation Unit here.